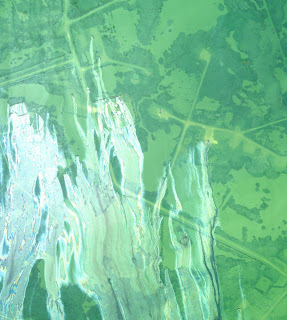 To see before-and-after, high-resolution imagery showing the destruction wrought by Hurricane Ike in the Galveston area, go to Google LatLong: The aftermath of Hurricane Ike. 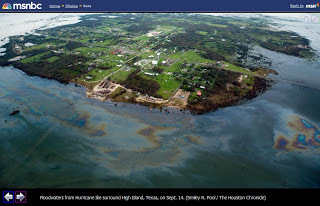 Oil slicks covering Hurricane Ike floodwaters around High Island, Texas. Photograph by Smiley N. Pool / The Houston Chronicle via MSNBC. 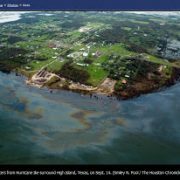 MSNBC is running a small gallery of photos of post-Ike destruction, including a shot by The Houston Chronicle showing oil slicks covering floodwaters around High Island, Texas. This is the same area shown in SkyTruth’s mosaic of NOAA aerial photographs, and it was taken on the same day (September 14). It’s pretty clear that this is indeed floating oil. You can follow this particular slick back to multiple sources on our mosaic, or by using Google Earth (look at Mosaic 8 in this KMZ file to see the High Island slicks). We’ve made a mosaic with a few of the NOAA air photos that show some probable oil slicks in the Galveston area in the wake of Hurricane Ike. Here’s a larger view. And if you want to download a 30″ x 12″ version (at 200dpi), click here. These images show an area that is still under a few feet of water — you can see roads and other features through the greenish murk of the floodwaters. And now you can explore the NOAA air photos with Google Earth. GE users, here is the KMZ file. This is very useful – you can toggle the NOAA photos on and off, and see from the underlying hi-res Google imagery exactly what facilities seem to be the source of the slicks. Mosaic 8 in the KMZ includes the area shown in the SkyTruth mosaic at the top of this post. NOAA has just posted aerial photographs taken on September 14-15 in the Galveston area. These photos show what might be oil slicks, some originating at what appear to be large storage tanks. We can’t say for sure at this point, and we can’t tell how thick the oil is from these photographs — much of it may be thin “sheen” — so we don’t know how big these possible spills are. So take a look for yourself. Here’s our preliminary analysis. We don’t have any confirmation so be skeptical. If you can confirm or refute any of this, please provide a comment. Ike came ashore in Galveston, Texas, early Saturday morning as a Category 2 storm with maximum sustained winds of 110 mph. Storm surge was about 10 feet, much less than the predicted range of 20 – 25 feet. Even so the storm caused extensive flooding throughout the Galveston – Houston area, and hurricane-force winds were felt well inland for several hours following landfall. No large oil spills have yet been reported. Early damage reports to oil and gas facilities include 10 offshore oil and gas production platforms damaged or destroyed, along with “some” pipelines; one shallow-water jackup rig damaged; and two mobile drilling rigs adrift in the central Gulf. The US Coast Guard is going out to fetch them. One of the key conclusions was the need for stronger mooring systems that anchor rigs to the sea floor, sometimes in thousands of feet of water. That’s prompted major rig owners like Transocean Inc. and Noble Drilling Inc. to increase the number of anchor lines from eight or nine to 12 in some cases. One of Transocean’s moored rigs, the Marianas, broke free during Hurricane Rita in September 2005 and drifted 140 miles (225 kilometers). Another, the Deepwater Nautilus, was set adrift a month earlier by Katrina. Such unscheduled voyages can be costly. Besides lost revenue, Transocean spent $25 million (euro19 million) to fix and upgrade the two rigs, both of which now have 12-point mooring systems. Katrina and Rita were Cat 5 monsters in the Gulf with sustained winds reaching 175 mph. But another of Transocean’s mobile rigs, the Amirante, suffered damage to its mooring system from the relatively weak Hurricane Gustav and was towed back to port for repairs. Ike’s winds (110 mph) were weaker than Gustav’s (115 mph). It’s only a matter of time before the Gulf will experience another major Category 4 or 5 hurricane. Maybe those mooring systems need another serious look. I’ll bet the companies that insure those rigs will insist. Check out the discussion on The Oil Drum blog if you want to learn more.